Posted September 4, 2014 by Lucia Osborne-Crowley & filed under City News. On Friday August 29, Elsie Refuge for Women and Children in Glebe was taken over by St Vincent de Paul Society. Established in 1974 by Dr Anne Summers, Elsie was the first women’s refuge to open in Australia. Over the 40 years since it opened, Elsie has remained independently-run and has specialised in providing care to women and children fleeing domestic violence. Last week, Elsie became among the first of its kind to be taken over by large religious organisations under the NSW Government’s Going Home Staying Home reforms. Under its new management by St Vincent de Paul, the refuge will become a general homelessness shelter that will have the capacity to house men as well as women. Deputy Lord Mayor of the City of Sydney Robyn Kemmis expressed her concern about this element of the takeover. “I am concerned about the possible impacts of the NSW Government’s Going Home Staying Home Reform Plan on specialist crisis services. The Government has included women’s services within their generalist homelessness policy response, and I am concerned that the complexity of the issues may not be recognised,” she said. 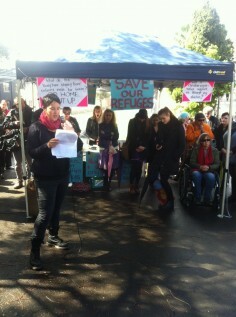 To protest the takeover, a rally was held in Minogue Crescent in Glebe on Friday (August 29). The rally was organised by community activist group No Shelter and was attended by NSW Greens MLC Mehreen Faruqi, NSW Greens MLC Jamie Parker and Labor candidate for the state seat of Balmain Verity Firth. The rally was also well-attended by the community, with over 100 people attending throughout the event. One of the focuses of the protest was the negative impact Christian management would have on the work done by Elsie and other independent, women’s-only refuges. No Shelter representative Michelle Hoogesteger said she felt the extent of the impacts of these takeovers has not been articulated. One major aspects of this is the loss of confidentiality surrounding these refuges. “Ever since refuges were established forty years ago starting with Elsie’s, addresses have been entirely confidential. Only PO boxes are available for mail, people staying at the refuges know never to give out the addresses, workers never speak of it and you’ll never find it on the internet,” she said. Ms Hoogesteger also pointed out that the major loss in the takeover of independent refuges by large religious organisations will be in the loss of well-trained staff. “All the staff who have worked at Elsie for years, who understand power and control issues and understand the dynamics of violence have been made redundant,” she said. All the staff at Elsie will be replaced by general homelessness staff at St Vincent de Paul. Deputy Lord Mayor Kemmis echoed this concern. Finally, Ms Hoogesteger highlighted the danger of allowing men and women to be housed in the same generalist services when many women and children using these services were doing so to escape domestic violence. “To place women and children who have escaped domestic violence – who are still very much in survival mode – in a situation where they feel an immediate threat from the person they share a bathroom with is completely inappropriate,” she said. A spokesperson for the Department of Family and Community Services said the contracts ensure this would not necessarily be the case. Ms Hoogesteger said these changes were a deliberate outcome of the tender process introduced by the Going Home Staying Home reforms. “In some cases, only the large Christian organisations were able to tender, there were packages that were not offered to anyone else. So the government was very explicitly handing over services to them,” she said. A spokesperson from the Department of Family and Community Services said the management of refuges by religious organisations would not stop them from providing the services required. No Shelter this week announced a total of 44 shelters in NSW that cater specifically to women, the Indigenous population and young people that will be closed or taken over by October 31st.